Hospitals around the US have successfully used Fall TIPS to reduce fall and injury rates. We are happy to share these stories and testimonials from Fall TIPS Collaborative members. Share the story of your Fall TIPS implementation. Contact us. Montefiore Medical Center (MMC) is a large, diverse academic medical system in New York City. Their implementation of Fall TIPS began with a pilot, using the laminated paper poster. The average fall-with-injury rate per thousand patient days decreased from 0.47 to 0.31 from the pre-implementation to post implementation period.1 Seeing a reduction in their fall-with-injury rates, MMC decided to expand their implementation through their hospital system concurrent with their adoption of the EPIC Electronic Health Record system. New York-Presbyterian, one of the nation’s most comprehensive academic health care delivery systems implemented the Fall TIPS electronic poster, which they’re using with their EPIC EHR system. They print out patient education sheets along with the printed poster that hangs in patient rooms. Now, all falls are evaluated in the context of Fall TIPS, and every fall is discussed at the leadership level. With this demonstrated success, New York-Presbyterian is looking to use the Fall TIPS process as a framework for additional new programs, helping staff to see the connections between these programs in improving patient safety and health outcomes, rather than perceiving them as separate, disconnected processes. St. Joseph’s Health is a world-class hospital and healthcare network supported by leading and renowned physicians, nurses and care teams. The organization is committed to providing exceptional quality care for patients and communities, with a special concern for those who are poor, vulnerable and underserved. St. Joseph’s University Medical Center (SJUMC) in Paterson, NJ, and St. Joseph’s Wayne Medical Center (SJWMC) in Wayne, NJ, house approximately 850 inpatient beds. The nursing staff currently uses the Johns Hopkins Falls Risk Assessment tool and uses the falls TIPS tool, developed by Dr. Dykes, as a stand-alone instrument to engage patients in falls prevention. 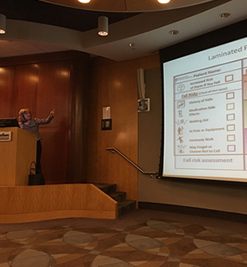 The Nursing Department will be standardizing our Falls risk assessment tool by moving to the Morse Falls Risk Assessment tool with our upcoming computerized EHR platform. At SJUMC, the TIPS tool is used on 15 adult inpatient units, including neurological and psychiatric units. At SJWMC, the tool is used on four hospital units and within an acute rehabilitation unit. This patient engagement tool for falls prevention was piloted on three nursing units for at least six months (acute rehabilitation unit, Neurological unit and cardiac telemetry unit) in 2016 and 2017 with success, resulting in decreased falls rates on each pilot unit at the six-month mark. 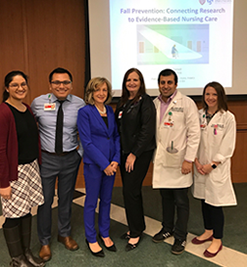 Results of the pilot program were brought to the Directors of Nursing Committee meeting, where the Falls Safety Team was asked to implement the tool in additional units. We tightened our internal benchmarks for falls reduction, which also coincided with this initiative. By May 2018, the tool has rolled out to all adult units (total 20 units) on both campuses. Auditing compliance will ensue for three months during each shift on each unit. Pilot units have seen compliance over 90% by the third month of use. Falls rates on each unit will be observed for six months after first use of the tool to determine impact. 1Dykes, P.C., et al., Pilot Testing Fall TIPS (Tailoring Interventions for Patient Safety): a Patient-Centered Fall Prevention Toolkit. Joint Commission Journal on Quality and Patient Safety, 2017. 43(8): p. 403-413. 2Dykes, P.C., et al., Pilot Testing Fall TIPS (Tailoring Interventions for Patient Safety): a Patient-Centered Fall Prevention Toolkit. Joint Commission Journal on Quality and Patient Safety, 2017. 43(8): p. 403-413. 3Dykes, P.C., et al., Pilot Testing Fall TIPS (Tailoring Interventions for Patient Safety): a Patient-Centered Fall Prevention Toolkit. Joint Commission Journal on Quality and Patient Safety, 2017. 43(8): p. 403-413.